Urschel’s Model CC is a centrifugal slicer or shredder. URSCHEL Laboratories, represented in Australia by Heat and Control Pty Ltd , has launched a variety of new shredding head options for its popular Model CC Shredder that offers more horsepower with an available 10HP motor option. Applications for this new model include shredding potatoes, cheese, cabbage, lettuce, and carrots for salad ingredients. New double ring/single adjustment/self-locking shredding heads are available with new Model CC shredders and for use with installed Model CC shredders in the field. The new self-locking feature enables secure fastening of the head with a simple turn locking feature. The head may be removed in the same fashion to ease maintenance and cleaning procedures, thereby lessening downtime. 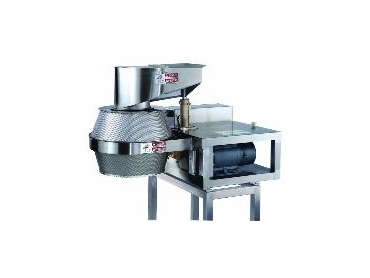 The Model CC is a versatile centrifugal slicer or shredder. The product enters the rotating impeller and is held by centrifugal force against the inner surface of the cutting head, which consists of eight individual cutting stations. Slices or shreds (depending on head set-up) as the product passes each knife in a smooth and uninterrupted manner. The versatile Model CC uniformly slices, strip cuts, shreds and granulates a wide variety of products at high production capabilities. With interchangeable cutting heads that enable processors to change the type of cut in just minutes, the Model CC minimises downtime and increases production efficiency. The shredder includes specially designed throw-away knives that do not require sharpening and are inexpensive to replace. The Model CC features continuous operation for uninterrupted production, simplified design for easy cleanup and proven dependability for maintenance and production.